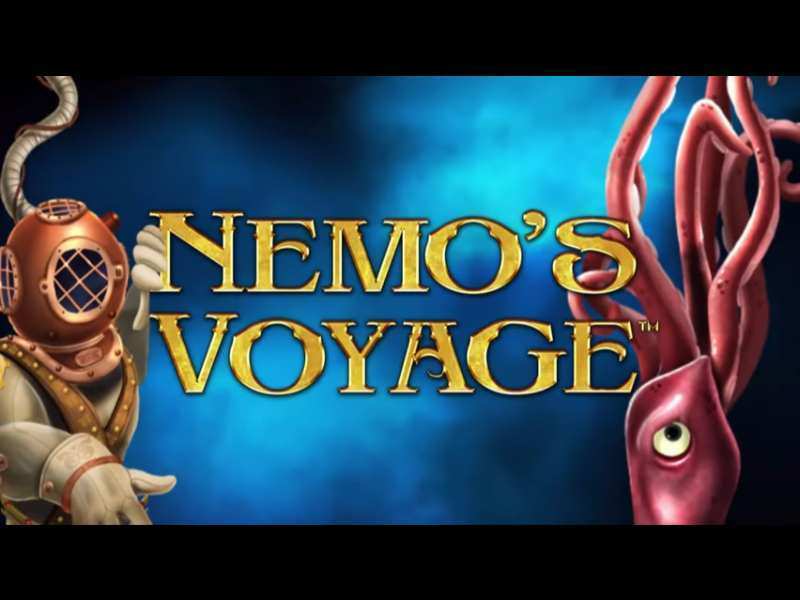 The Nemo’s Voyage is a 5-reel adventure slot developed by the WMS casino machine producer. This is a slot game that comes in 40 lines version and it is full of extra features at every step. Scoring possibilities will just keep growing after each round. The game theme is set in the middle of the ocean with sharks and other creators swimming behind reels. If bettors want to play this online 3-D casino machine with no download needed, they can visit their betting platform and search for it in the UK and other countries (it can be played in a demo version for fun and for real money). The Nemo’s Voyage games are all about discovering new things but before a player decides to begin betting, he/she needs to adjust some of the basic functions. To spin the wheel of fortune in Nemo’s Voyage slots, gamers can click on the “Spin” button. For more comfort betting, gamblers can simply click on the “Autoplay” mark where the number of consecutive spins can be set. After that, the wheel will be spun automatically with the possibility to stop it at every moment manually by clicking on the stop button. If bonus rounds are triggered, this function will be stopped automatically. For setting stakes, bettors can use plus and minus buttons but be aware that when a wager is changed all features will be started again from the beginning. The minimum amount of money that can be placed is 0.40 coins. For adjusting bets to the highest amount, players can increase bet per line and by doing that determine the total wager (200 coins for a single spin). For any other additional information, bettors can visit the “Paytable” window. If gamers want to play free Nemo’s Voyage casino slot machine, they can collect 2 big 3-field icons, lots of sea-themed symbols, bonus signs and different types of wilds as they progress more into depth. A bonus icon is a special scatter symbol that can be gathered on reels 1, 3 and 5. When 3 of them are placed on reels in the same spin, a free spinning feature will be triggered. For gaining them, bettors will get 8 extra rounds. While this feature is on, gamers will obtain a special chance to get sticky wild cards randomly after each turn. When it is over, all of the earned cash will be added to the total credit balance. When a gambler opens the Nemo’s Voyage online casino slot machine, he/she will find a pressure gauge located on the right side of a betting screen. This gauge has 4 limiters. Each level offers a special wild feature that will help players to win additional prizes and increase their winning possibilities. A Multiplier Wild feature is the first that can be triggered. After each spin, a submarine will go down more. When it activates this feature, special wild icons can pop out. If one of them is included in a winning combination, a win will be multiplied by the wild card number (2 or 3 times). The Pressurized Wild feature is the second level that can be reached. While it lasts, gamers can use a special card that can squish symbols below it and replaced them with more wild icons. They can also be used in the same spin to combine more winning lines and bring additional bonus prizes. The third level that can be reached if players keep coming down is the Clumped Wild sign. Lots of special icons will pop out all over reels bringing extra cash and even more scoring chances. A Wild Reels feature is the last special bonus that can be triggered when a gambler reaches the bottom of an ocean. For doing that, he/she will get a random number of wild reels from 1 to 3 after each spin. When this happens, all symbols on those reels will act as wilds. A submarine will always be on the move with a small difference when coming up and down. When it is descending, it will go further after each spin but when it is going up it will continually ascend to the top. Bettors can find 2 extra symbols that can help them on this trip. They are increase and decrease pressure icons. These symbols can pop out only on reel number 5. The Nemo’s Voyage online casino slot offers multiple ways to score. The best thing that bettors can do is to try to bet more. The main goal of a game is to go to the bottom of an ocean. This is a place where gamblers will have the highest RTP. The theoretical return to a player in this pokie is between 95.01% and 99%. For more extra prizes and scoring possibilities, players can find 3 or more scatter icons and trigger a free spinning feature. Check out 4 different wild features with unique abilities and extra winning chances. 0 responses to "Nemo’s Voyage Slot"